Becoming a private investigator is a very rewarding career choice, giving you the skills and opportunity to help others in troubled situations, in return for a good income. 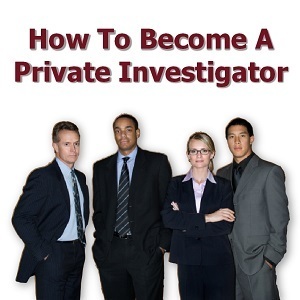 The purpose of this guide is to show you how to become a private investigator and give you insight of what it takes to successfully move into this career. We will provide you with a clear step by step path, covering the qualities, what you need to learn (and do), to become a private detective. If you're not sure what a private investigator is or what they do, then read this article first - what is a private investigator - and then come back to this one. On this step we're going to help you to really decide whether or not a private investigator career is for you. We're going to help you iron out any doubts or uncertainties, so you know for sure you want to become a private investigator, and not waste your time and money. We want to sort out those who truly want it as a career - and are willing to put in the effort, training and expense - from those who don't. First of all think about why you decided you want to become a PI. What's the reason? + Was it out of boredom and you thought it would make life more interesting? + Was it because you saw a detective movie or read a detective novel? + Was it out of trying to impress others? + Did you want to get revenge on someone by finding out their dirty secrets? + Was it just because you fancy doing it out of some whim? If it's any of the above reasons then you really need to rethink, or look for another career! Try this little practical on yourself... This is a soul searching step and well worth doing. Take your time to really understand why you want this career... Really think about it for a minute or so... Write it down... Be exact in you purpose for becoming a private detective... Are you done? Ok. 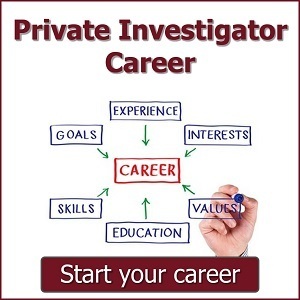 So hopefully you have found the exact truth of why you want a private investigator career. And hopefully, for you, it's a meaningful purpose. We're assuming now, that by moving on to read this next step, you are serious about being a private investigator. Well done! We're glad we haven't put you off. Now we'll look at the requirements of becoming a private investigator from two angles. What should the character of a private investigator be? It's fairly safe to assume that all states and countries (where licensing is concerned) require an individual to have no criminal record. But what does that really mean? We know from experience someone doesn't have to have a criminal record to be a criminal - they just haven't been found out. We know from experience there are bad apples in any profession without criminal records that perhaps should have one. We know this isn't a perfect world, but nevertheless, someone wanting to become a private detective should have a high sense of ethics. This is most important! Ethical: A private investigator needs to be highly ethical, being able to act rationally in difficult situations and not be swayed into unethical, bad practices. Inquisitive: A PI should have an enquiring mind and be able to sift through data logically, making sense of what they find. Tenacious: An investigator has to be able to push through barriers that prevent ongoing investigation. Resourceful: An investigator needs to be a solver, coming up with solutions where there seem to be none. Now, if you were put off from becoming a private investigator because you think you don't have, or are lacking in these qualities; don't worry! The purpose of this guide, is get YOU, to look at YOU. Its purpose is to help you to see; firstly - do you really want this as a career, and secondly - what you need to become, and do, to achieve it. If you found qualities in yourself that you are lacking, or weak in, then you can work on and improve them as you train. A truly great detective is one who knows their weak points and does something to improve themself. As with other licensed professions, legal regulation is designed to protect public citizens against unauthorized or unqualified private investigators. It also serves to enforce high professional standards among those that are licensed. Depending on what State or Country you live, or plan to operate in as a private detective, will determine what legal requirements are needed. You can learn more about private investigator licensing requirements for your State just by clicking on the relevant link below. Before individuals can become licensed they usually need to have some level of work experience in the investigative field, as well as some form of education, or pre-licensure training. The training and work experience needed to become a private investigator varies from State to State. So be sure to check your State requirements first. (See the table above). Private investigator training is an important part in the career of an investigator, not just at the start of the career, but throughout. You must learn the basic and advanced skills if you want to succeed and become a highly skilled investigator. Completing some formal educational program, such as gaining an associate’s or bachelor’s degree in criminal justice, will provide you with the educational qualification needed for licensing. You will also gain a basic understanding of the criminal justice system, which is important for becoming a private investigator. Another way of building your education level prior to license application is to complete an undergraduate academic certificate or diploma. Private investigator certificate and diploma programs are ideal for learning how to become a private investigator. They can be taught in a classroom, or online, and are sometimes taught by legal professionals or private investigators. The work experience needed to obtain a private investigator license is usually based on the number of hours worked. For example: an Indiana private investigator by State law needs to detail at least (two years) 4,000 hours or more of private investigative work. Whereas a Nevada private investigator requires at least 5 years (2,000 hours each year, totaling 10,000 hours) experience as an investigator. You should check your State's licensing requirements to see what work experience is needed (if any), as each State is different. Not all States require mandatory work experience to become a private investigator. If you've worked in Government or State law enforcement, or other legal related roles, or possibly the military, this can count towards your work experience. One of the difficulties of becoming a licensed private investigator - if you haven't worked in related fields - is gaining the legally required work experience. But how do you get it? One way to get experience as a private investigator is to join an already operating licensed investigator, or investigation firm. You can ask them to take you on as a part-time, or full-time employee, or as an intern for a time until you prove yourself worthy of a more permanent position. You may even consider voluntary work as a PI. The way to make yourself highly employable is by getting as much PI training and education as you can and become a highly valuable asset. No PI agency will take on anyone that doesn't have something valuable to offer them in return. So offer them something they can't resist. If you're serious about becoming a private detective and lack experience and training - GET TRAINED! Once you have built up your training and experience, the next step is to apply for your private investigator's license for the state you intend to work. Some states require applicants to pass an examination before they can be licensed as a private detective. These examinations assess applicants on their knowledge of local State level laws and procedures, as well as rules and regulations relating to working as and operating a private investigation business. The exam is usually taken after applying for a state investigator license. The State examinations can be complex due to the amount of information covered and it is advised candidates prepare for the exam. Some states require candidates to complete a training program before they apply for a private investigator license. This may include a 60 hour entry-level private investigator training program. It's a good idea to enroll on one of the state-approved basic training courses before you take the State exam. This can give you additional knowledge, not just for the examination, but to use in your private investigator career. Some schools offer a 40 hour private investigation training course designed to prepare students for the state exam. Private investigator continued education is a must if you want to stay on top of your game. Many States, as part of your PI license renewal, require you to have completed some form of investigator continued education. This is usually built up of a number of hours over a 1 or 2 year period, depending on which State you operate. The number of hours required vary, for example; Iowa private investigators are required to do 12 hours of continued education every 2 years and Kansas investigators 8 hours every 2 years. Considering how laws, procedures, techniques, and technologies change, it is wise after becoming a private investigator to keep up to date on all aspects of investigative fields. 8 to 12 hours in 2 years isn't nearly enough! Continuing education is an excellent way to stay current and to learn the newest techniques and theories related to the field of private investigation. If you want to be the best, if you want to become an expert private investigator - TRAIN, TRAIN and CONTINUE TRAINING throughout your PI career. The scope of work of a private investigator is a very broad and sweeping one, covering many fields and needing many various skills. Most investigators perform all the usual basic investigative functions, such as surveillance and finding missing people, but you can specialise in your career - choosing a private investigator job that focuses on one particular area. You may wish to do additional courses in one of these basic areas and focus solely on becoming highly skilled in this service. There are many private investigator schools offering these types of specialist courses, and many private investigator associations offer training courses to their members. Knowing the steps of how to become a private investigator is simple, just locate your State's requirements and DO what is necessary. You just have to DO the steps needed to get you there, and if you really want to become an investigator you will make it happen. Good Luck!